If you have any questions or information about this drum set, do please contact me. 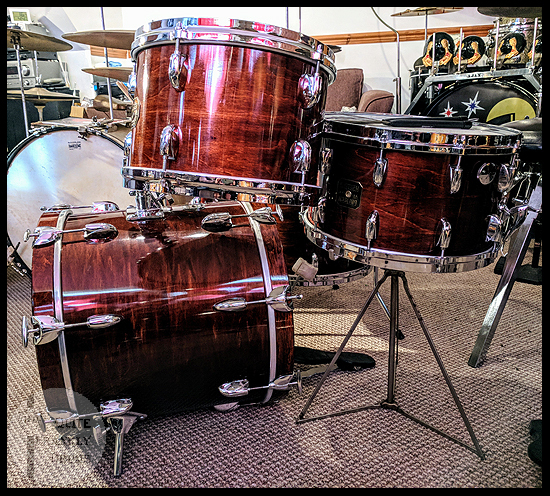 I purchased 3/5ths of this drum set on the 19th February, 2018, but the history of the snare drum dates back to 1985 when I purchased it new. This is a set that was made in history and somehow, by fate / karma / luck, whatever you wish to call it, has come together 30+ years later. It is a very long story, so I will save the more detailed version for a blog post that I will link to from this page shortly. For now, I will say it all started back in 1984. 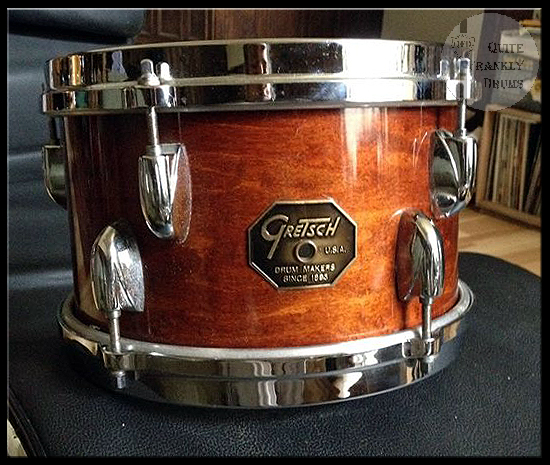 The previous year, Phil Collins had switched from the Pearl Concert Tom BLX set that I now own to Gretsch and by the time he and I next met up, I had returned to playing the drums and was in the market for a new set. 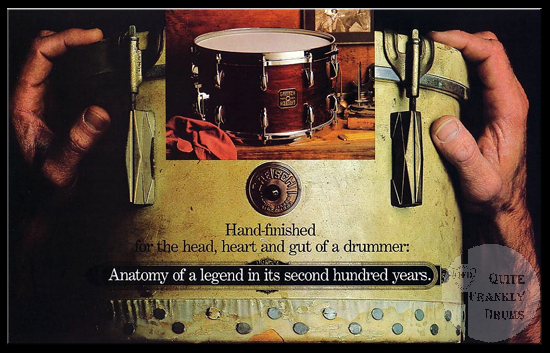 He recommended the Gretsch 14x8" Power snare to me, but as it didn't appear to be stocked in the UK, I had to order one, finally taking delivery on the 2nd February 1985 from Pro Percussion in Kentish Town, London. 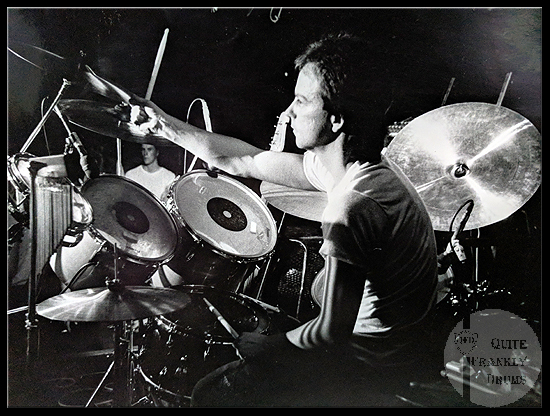 Within a few months, I had joined a band called Pride Of Passion that contained some former members of Marillion and our first show was at the legendary Marquee Club in London. My new Premier drum kit had (still) not been delivered, so a borrowed set from my cousin sat around the stunning new Gretsch snare at that debut gig and the shows that followed. 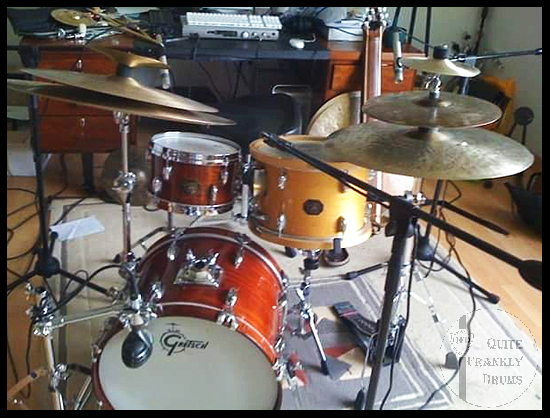 As will be detailed in the blog, my drumming days ended soon after, but for 24 years until I picked up the sticks once more, only that Gretsch snare and one other drum remained with me. 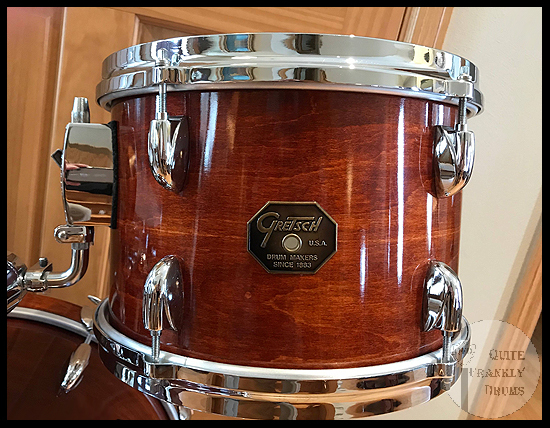 The Gretsch snare has remained one of my most prized drums, yet ironically, despite having this large collection of drum sets and many others now gone, since my much interrupted return to playing began, the snare oddly remained unattached to a drum set. Perhaps waiting for it's true time to shine?.. Over the last few years I have seen perhaps only 2-3 Gretsch Rosewood 1980's sets become available in the UK. Always in rock sizes, such as the following set that I even had my hand on the phone ready to call, but once again, I had stepped back from making a purchase as I knew I was after something different without knowing what. 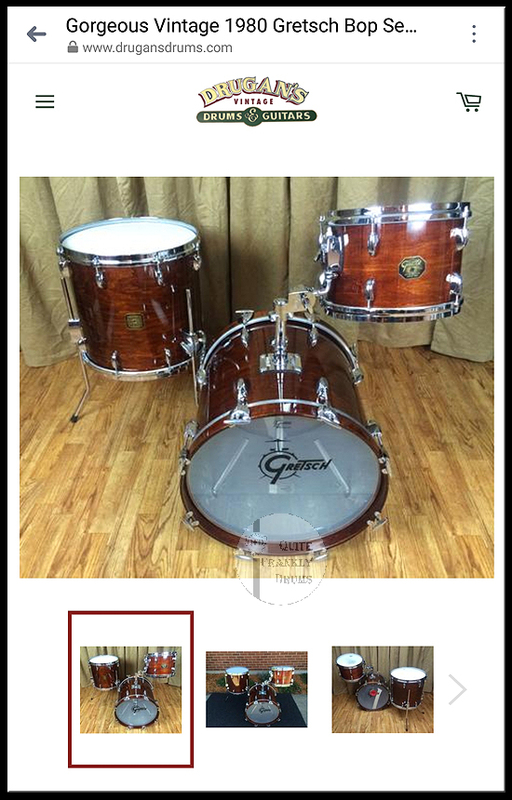 I saw a stunning looking 1970's Gretsch set in Walnut that had (sadly for me) just been advertised and purchased without me spotting it. The walnut looked so close to my Rosewood set, I thought I would look at that as an option. Ironically, it didn't take long to locate a very rare set, although in America. Tony the kit's owner could not have been more helpful in answering all of my detailed questions and a deal was struck to ship it over to the UK. Upon arrival, I was stunned just how similar my Rosewood was to the set in Walnut. The matching Jasper shells sung beautifully together, I could not have been happier! As with all of the drum sets in my collection, researching the back story and history where it can be obtained, is not only great fun, but also often elevates the drums to a new level of inspiration when you sit and play them and think about what they have seen and heard in their lifetime. This set actually has a limited history, but one or two elements make it very interesting. 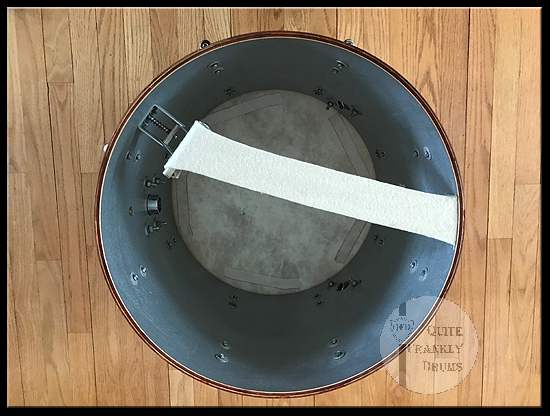 The bass drum, floor tom and upper tom were owned from new and factory handpicked in the 1980's by a Latin Jazz drummer who was living in the Chicago area. The set was obtained from an estate sale by Drugan's Drums in August of 2015, but it is not known if the owner was merely selling up or had in fact passed away. 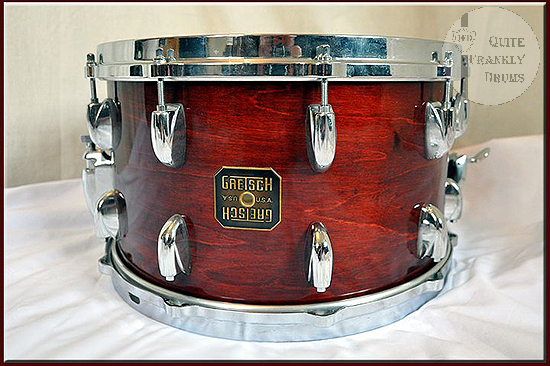 "For your viewing pleasure is this beautiful 1980 Gretsch bop outfit in stunning Rosewood. These drums come from the original owner & have been VERY well cared for. These drums are 100% original with the exception of the heads on the 12" tom & the bottom head of the floor tom (both bass heads & top floor tom head are originals). These are of course all 6 ply Jasper shells. This is one of the best sounding sets we've ever played in these sizes - they undeniably have "That Great Gretsch Sound". While this set was definitely all purchased together by the original owner & is a factory matched set, the 12" tom was built slightly earlier & displays the earlier drop G stop sign badge while the rest of the set has the square badges. It is quite common in the very early 80's for factory sets to come with mixed badges as this was a transitionary time for Gretsch badges." Needless to say it took just two days for the drum set to sell. 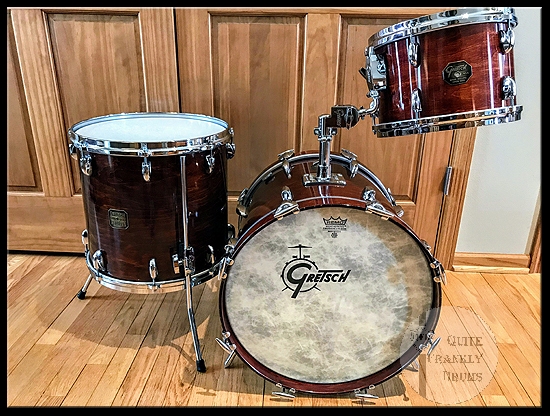 The buyer decided to keep the drums just a few months before a deal was agreed and later completed at the Chicago Drum Show in May 2016 when Tony purchased the set for his own collection. You may notice that one word in the description above is highlighted? 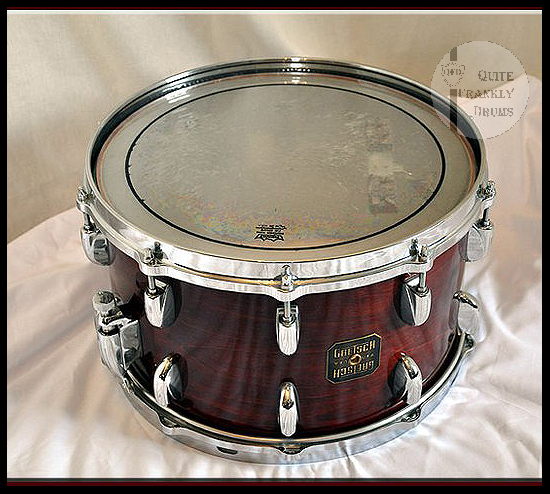 That is why the drums were a perfect match for my snare, they were in fact Rosewood and not Walnut! 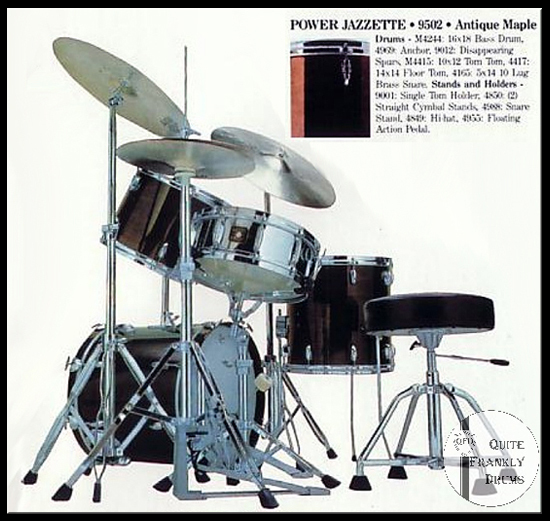 From around 1983, Gretsch had offered a number of configurations of a set they called the 'Power Jazzette' and both the bass drum and floor tom were from that Power range, curiously as was my snare. 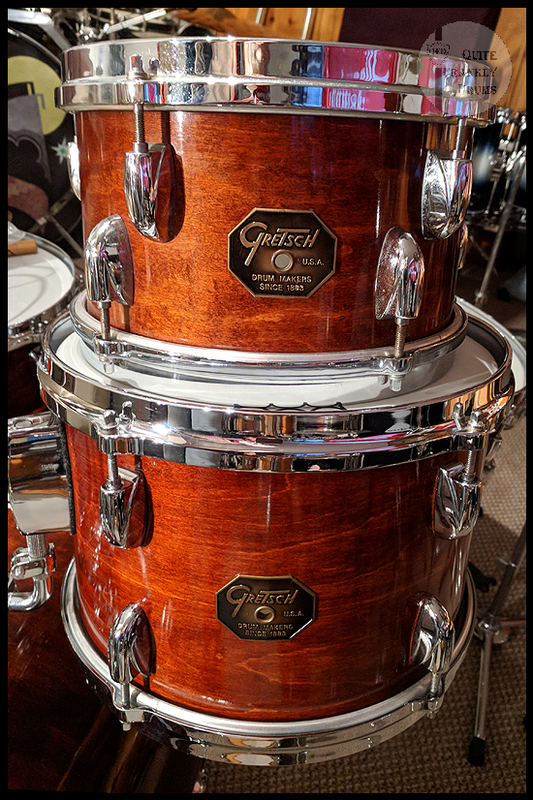 To replicate my 'standard' go to set up, prior to the set arriving from America, I had also grabbed a period matching Gretsch Walnut 10x6" tom. The arrival of the small tom confirmed the Walnut / Rosewood finish difference, albeit not that great a difference, perhaps age has played a part there? Ironically, even with my two additions, the whole set spans the same early 1980's period. 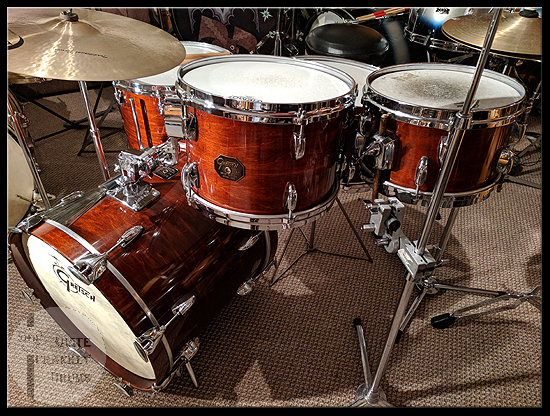 I enquired after any known history of the 10x6" Tom Tom and the seller informed me that he had never used it and had bought it to go with his own Walnut Gretsch set the was in restoration. He had however purchased it from none other than Ric Byer (05Ric) who I know very well through our internet discussions. I've been a big fan of his musical output for 10 or more years and some of you may already know of his work with Gavin Harrison (GH05), the Snow Giants and of course his own incredible solo releases as 05Ric. A multi-instrumentalist, his incredibly delicate and musical drumming style had caught my attention and made him one of my favourite drummers. Along with his unique Gretsch based custom drum set and use of a beautiful Spizzichino cymbal, his playing was mezmorizing. Ric had owned the small Gretsch Tom since 2007 when he bought it as part of an 18x14" Bass drum, 13x9" Tom, 10x6" tom drum set from Drum Shack in London. 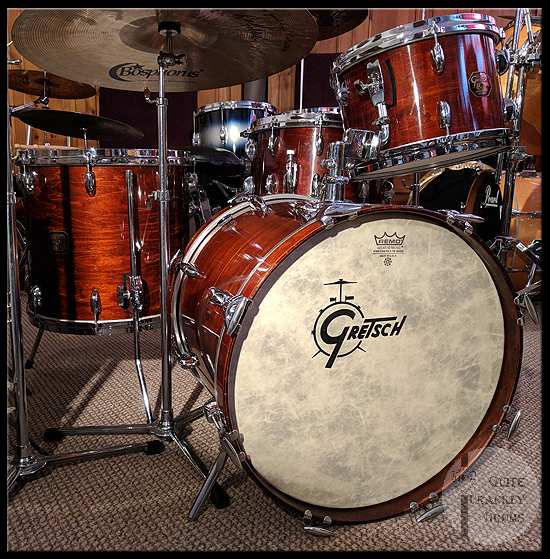 In early 2017, Ric had moved back to his favoured 16x12" bass drum and built his new custom Gretsch around that, selling the 10x6” in March 12th, 2017, but it had appeared on much of his recorded drum work for the previous 10 years. I thoroughly recommend you check out Ric's work and the 10x6" tom I now have in my set can be viewed in the video below along with numerous others from his sessions and live work. If you have read this far, you will now understand how special this drum set is and that somehow it seems it destined to come together. The legendary Jasper shells sing beautifully and are a unique sound within my collection with the bright but dry punchy attack from the toms that define 'that great Gretsch sound'. Tony Williams remains a firm favourite of mine and The New Tony Williams Lifetime 'Believe It' album is a total classic with 'Fred' sitting in my all time favourite tracks list. 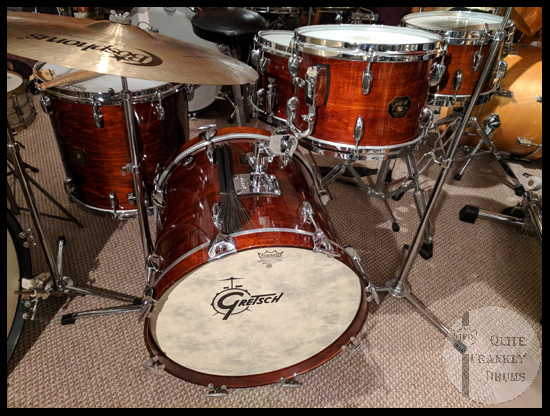 His Gretsch 1970's /1980's SSB drums are as iconic to me just as the Gene Krupa and Radio King drums are for Slingerland and to now own a set of drums with that legendarry sound and history, is very special indeed. Tony played a 'similar' 12/14/18" sized set up until the mid 1970's and this set very much reminds me of that. It occurred to me while playing the set that the cymbals I have chosen have that 'Tony Williams sound', especially the Avedis Zildjian Hi-hats which sound remarkably like Tony's with mine coming with a set of drums I have from the 1960's. An opportunity also arose to add one of the extremely limited Istanbul Mehmet 18" Tony Williams Tribute Crash cymbals to the set (05/250) and naturally that had to be done.. These limited edition cymbal sets were released in 2017 and were crafted from Tony's own cymbals with the crash being just over 18" in size. Mine is from the 5th set of the 250 made. A perfect edtion to the Gretsch outfit. Without question, this is a top five, possibly even a top 3 favourite set in my collection and one that I simply cannot hear enough of! It was well worth the 33 year wait to find such a stunning and unique home for my treasured 14x8" Gretsch Power snare.